Thanks to its location, in Valle di Ledro you can hike from the 65 m of Lake Garda to the 2254 m of Monte Cadria: 2000 m difference in level with a high variety of landscapes, views, nature and flowers, where you can hike and trek all year round! To discover nature, history and traditions of Valle di Ledro, the local Tourist Board organizes a hiking and walking program from May until October. To discover nature, history and traditions of Valle di Ledro, the local Tourist Board organizes a hiking and walking program from May until October. Every week there are three hikes/walks: on Tuesday and on Friday are in program half day walks, suitable also for families with children; on Wednesday there are daily hikes, which require a certain training. The local guides take you to the best spots around Lake Ledro. Along the valley floor, you can make pleasant and relaxing walks with a difference in level not relevant. The walk around the lake is completely level and suitable for all the people offering you marvelous views on the landscapes surroundings. Val Concei and Val di Pur, for example, allow you to walk in complete relax, encircled from the green of woods and nature. Along Val Concei there is a naturalistic path, that crosses secular woods of pine and beech trees. In Val di Pur, you can also visit the works of Ledro Land Art, a new artistic path leading to Malga Cita. To Tiarno di Sotto and Tiarno di Sopra, you can walk the 9 km of the cycle and pedestrian road that from Pieve go to Lake Ampola, a small lake covered by water lilies in the summer months. In the northern side there is a beautiful crown of mountains, from where stands out the Monte Cadria, the highest peak of the Alps of Ledro (2254 m). 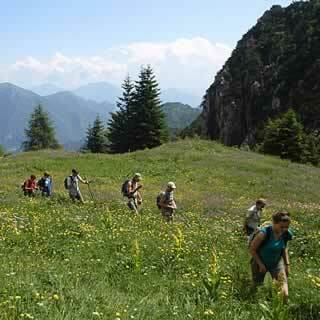 About long excursions, for expert hikers, we suggest the "Sentiero della Pace" (Path of Peace), which goes along the mountain peaks of Val Concei, from Passo Trat to Monte Cadria. The path allows you to see many of the Austrian military trenches built during the WWI and it can be covered in more than one day. On the southern side you find the Carone-Tremalzo-Tombea groups, particularly interesting from the botanical point of view and for the several excursion possibilities to Valvestino and the province of Brescia. The mountain group Tremalzo-Tombea is a Site of Community Interest because of its natural environment. From Tremalzo, where you can go up by car, you can take a path along the mountain ridges to Monte Corno, from, where you enjoy a 360° view over Lake Ledro and the valley. You can reach Monte Corno also from Pieve. Other mountains with a superb panoramas are Monte Cima d’Oro, reachable from Mezzolago, and Monte Cima Parì, along paths starting from Pieve (1400 m+) or from Malga Trat along Senter de le Vache or along the path passing from Rifugio Pernici.